Arp273 (UGC01810/UGC01813) is a distorted pair of galaxies in AND. RA 21h 21m 30.65s DEC 39deg 21’57". UGC01810 is the larger of the two galaxies and is classified as SA(s)b pec. S = Spiral. A = not barred. (s) = arms have spiral shape. b = moderately wound arms (a = more; c = less). pec = peculiar. The smaller UGC01813 is SB(s)a pec. Similar to M51, the smaller companion galaxy here is at the end of a tidal bridge indicating that a merger is occurring. 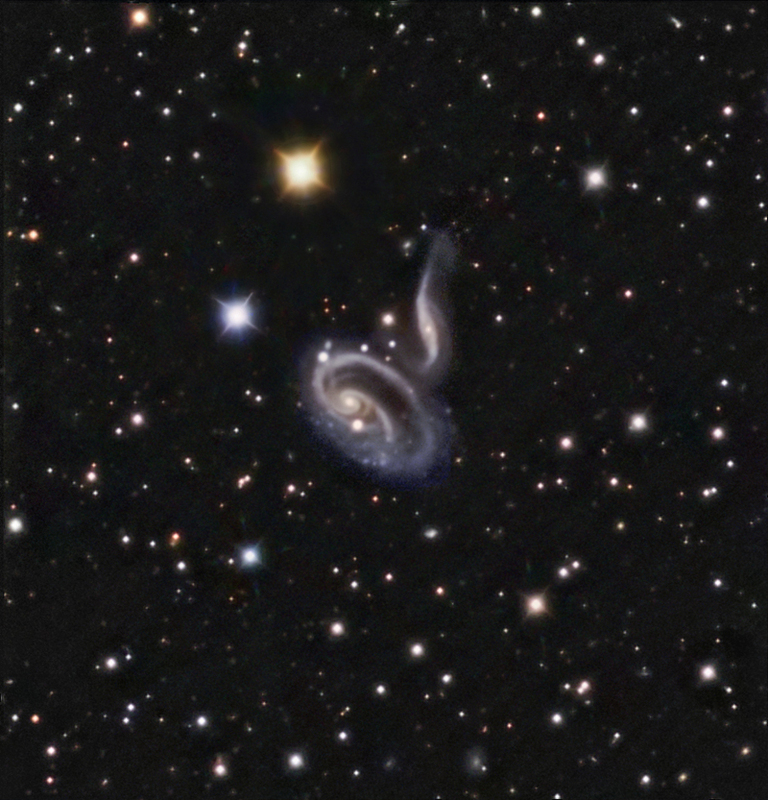 Arp273 is considered to be an "M51 Type" pair of merging galaxies. These galaxies are anywhere from 25 to 50 million light years away and have B magnitudes of 13.5 (UGC01810) and 15.2 (UGC01813). An excellent reference set may be found in a student paper. North is to the left. The image below is from the NED database from the 48" Schmidt at Palomar for comparison. 7 min sub-exposures were taken with the Apogee Alta U47 at -25C kindly loaned from Apogee in nearby Roseville, CA on Ken Crawford’s 20" RCOS RC telescope using Astrodon E-Series LRGB filters (all NIR blocked). Note that the NIR-blocked Luminance filter was required (rather than the unblocked Clear filter) to prevent a wavy backround due to an etalon effect caused by NIR light within the E2V back-thinned CCD. G2V color combine weights of 1:1:1.1 were used based upon measurements that night. I brought up the brightness in the image a bit to better show the tidal tails and interaction region.